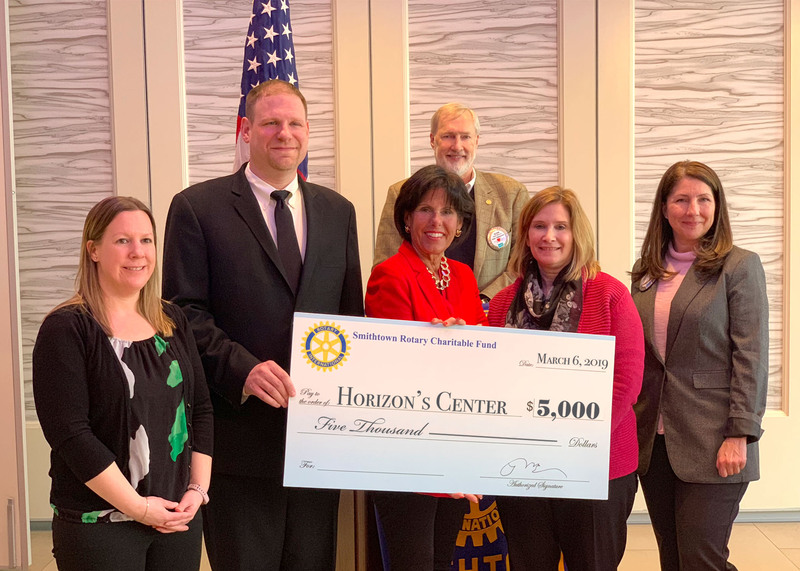 The Rotary Club of Smithtown presented a charitable donation to the Town of Smithtowns Horizons Center at the March 6th Luncheon, held at the Watermill Caterers. The check for $5,000 will go towards providing transportation to services and a special Substance Abuse Prevention Event featuring renowned Neuroscientist, Dr. Stephen Dewey. Town Councilwoman, Lynne Nowick presented the Rotary Club of Smithtown with an award for its continued service above self actions, efforts and generosity. Glenn Williams of the Rotary Club of Smithtown worked closely with Matthew Neebe, the Director of Horizons Center and Well Life Network Director, Meryl Camer to identify the best investment for the charitable donation. The team opted to provide the cost of transportation to services and host a substance abuse prevention event, featuring acclaimed addiction awareness speaker Dr. Stephen Dewey. Established in 1979, Horizons is an OASAS-licensed not-for-profit agency funded to provide adolescent and adult treatment, prevention and education services for drug and alcohol related problems. Services include assessment, counseling groups, individual sessions, and an array of specialized treatment and prevention programming.